The celebrated Shakespearian actor John Philip Kemble's performances as Coriolanus were regarded as some of his best, with his sister Sarah Siddons as Volumnia. Giles Waterfield (see reference works) considers the Soane painting to be that exhibited at the Royal Academy in 1793, no. 98, 'Mr. Kemble in the character of Coriolanus, Act IV, sc.3' (this scene is set in the play on 'A highway between Rome and Antium') rather than the second version exhibited in 1797, no. 322 'Mr. Kemble as Coriolanus, Act IV, sc.1' (described in the play as 'Rome. Before a gate of the City'). Waterfield says both pictures depict the same scene, Coriolanus arriving at the house of Tullius Aufidius but in fact, actually the RA catalogue descriptions refer to two different scenes - as described above. 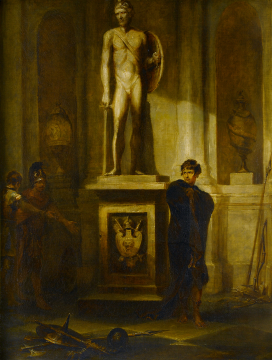 Britton's Union describes the painting as 'Coriolanus in the Hall of Tullius'. However, that would mean Act 4, Scene 5 which in the play is 'Antium. A hall in Aufidius's house'. An early inventory of the Soane collection (1840) identifies it as having been exhibited in 1797, no. 344. However, the 1797 version was engraved by Richard Earlom after Bourgeois and the mezzotint engraving is a landscape format with a military trophy to the right of Coriolanus (not what is shown in the Soane picture). The painting is first recorded in Soane's collection in Britton's Union of Architecture, Sculpture and Painting, 1827.